Ripon, WI – The National Frame Building Association (NFBA) held its annual convention and trade show, Frame Building Expo, February 18-20, 2015 in Louisville, Ky. During the NFBA's Award Luncheon, Doyle Pokorny, M.P.B. 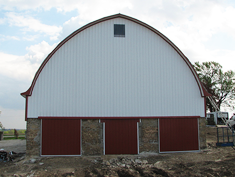 Builders, Inc., Ripon, Wis, was awarded the NFBA Livestock Facilities Building of the Year Award. This is a national award and only one livestock facility in the country is awarded this honor each year. The award was the result a new dairy complex, built for David and Donna Brown of Brown's Brown Swiss, Monroe, Wis. "The facilities were built on a new piece of land and were designed to ease work and for all the buildings to flow together seamlessly," states Doyle Pokorny, project manager. A total of five structures were built. The five (5) structures included: 1) Dairy Barn – an insulated and lined milking and housing facility complete with feed room, milk-house, utility room, manure storage and loose housing, 2) Calf Housing – a solar building to house calves from birth to 250 lbs., 3) Heifer Housing – designed to house animals 300 lbs. to freshening, 4) Heated Shop/Machine Storage - this is the farm shop along with equipment and long-term feed storage and 5) Equine Shelter - a simple run-in shelter for their equine. The livestock facilities and new home were completed in a five month window. "We are extremely happy with M.P.B. Builders and their performance. Their professionalism and ability to design the facilities around our vision, guaranteed top quality results that met the needs of our dairy," states David Brown. M.P.B. Builders, Inc. designs, engineers, and constructs buildings from commercial to agricultural, residential and equine buildings. M.P.B. Builders, Inc. is a diverse company, building post frame structures, steel/stud frame buildings, a material supplier to contractors, custom digging, drilling and equipment rental. March 15, 2010 - The National Frame Builders Association (NFBA) held its annual convention and trade show, Frame Building Expo, February 17- 19, 2010 at the Kentucky International Convention Center in Louisville, Kentucky. During the NFBA's Awards Luncheon on February 17, first place winners in 14 categories received plaques for the annual NFBA Building of the Year Contest. An additional 4 plaques were awarded from the judge’s awards category. The NFBA Building of the Year Award in the Livestock Facilities category went to Chris Kooiman, M.P.B. Builders, Inc., Waupun, WI. Built for Hoewisch Homestead Dairy, LLC, this building will be used to raise replacement dairy heifers for the producer's dairy operation. The young heifer section of the facility is constructed to allow better ventilation and bird control. The slope roof allows for good southern exposure and proper clearance for the feed equipment that will feed the groups on the south feed rail. The cost of building this heifer facility was kept down by building it out of post-frame materials. "Listening to the customer's wishes for the use and the appearance of the building, we had to figure out a way to maintain the flow of all the roofline of the building" explains Chris Kooiman. The customer wanted the rooflines to match because they thought that on such a large building (on their farm), it was important to be attractive from the highway. The M.P.B. Builders design team came up with a design and the customers liked it. Some unique materials were used, such as the CHI overhead doors, the Poly-carb solar panels – LVL header material, and the Steel square tubing to support columns on feed yard – custom solar panel vent design. "We have been in this facility for over 8 months, and we and our heifers could not be happier" states Kevin Hoewisch of Hoewisch Homestead Acres. The National Frame Building Association (NFBA) held its annual convention and trade show, Frame Building Expo, February 25-27, 2009 at the Gaylord Opryland Resort and Convention Center in Nashville, Tennessee. During NFBA's special award session on February 25, winners in 18 categories received plaques for the annual NFBA Building of the Year Contest. The 1st Place Building of the Year Award in the Industrial category went to Leo Souder of M.P.B. Builders, Inc., Ripon, WI. M.P.B. Builders, Inc. received the Award for the Weiland Refrigerated project, built for Weiland Trucking. The building is used as a refrigeration storage unit for cheese before shipment to its final destination. The building allows large quantities of product to be kept cool and preserved until it is split into smaller orders and shipped to other locations. The warehouse section uses Structural Insulated Panels for walls and ceilings to keep the building at the required temperature for the product. The loading dock is a post-frame and stud-frame structure to support the roof trusses with stud-framing between the posts for multiple interior finishes. Post-frame construction was chosen for this project to allow the builder to meet deadlines and construct at an accelerated rate. The post-frame design allowed the building shell to go up quickly so the mechanical contractors could work in an enclosed en Weiland Trucking now offers another benefit to their already successful logistics company by providing refrigerated warehousing for storage of perishable products. The 1st Place Building of the Year Award in the Livestock Facilities category went to Christopher Kooiman of M.P.B. Builders, Inc., Ripon, WI. M.P.B. Builders, Inc. received the Award for the Weise Dairy project, built for Weise Dairy. This is a housing and milking facility for dairy cows. The building allowed the customer to double their herd size and reduce labor. The builder used many different styles of roof systems in this building. In the free stall area, they used LVL material supported by laminated columns. The Royale Building System (RBS) walls in the milking parlor give a nice bright finish and are easy to clean. The customer looked into steel-frame construction, but the builder showed them that they could save nearly $10,000 on the column prices alone by using post-frame. With many turn-of-the-century barns outliving their usefulness, dairy farmers are looking to get into cleaner, more user-friendly buildings without having to expand to the point of being a "Corporate Farm". Post-frame met this need. The National Frame Building Association (NFBA) held its annual convention and trade show, Frame Building Expo, February 20-22, 2008 in Columbus Ohio. During the NFBA'S Award Luncheon on February 20, first place winners received plaques for the annual NFBA Building of the Year Contest. The NFBA Building of the Year Award in the Livestock Facilities category went to Chris Kooiman, M.P.B. Builders, Inc., Ripon, WI. M.P.B. Builders, Inc. received the NFBA award for the new post-frame building built for Kevin Roche of Roche Farms, Inc. of Columbus Wisconsin. The building is designed and used as a steer feeding facility. 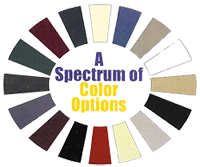 In the spring of 2007, Kevin Roche of Roche Farms Incorporated from Columbus, Wisconsin, contacted us at M.P.B. Builders in regards to a possible design of a steer feeding facility. Having a livestock background, I was given the sales lead and met with Kevin the next day. Kevin had done quite a bit of homework on his own and really had a design in mind. What Kevin was basing his thoughts on was a design of a steel structure that he had seen in western Iowa. With several post frame buildings on his farm, Kevin posed the question, "Can we build this building using post frame construction?" After coming back to the office and talking things over with Leo Souder, the owner of M.P.B. Builders, and Gavin Dorsch, head of our design department, we came up with a plan. The building dimensions are 100'x 250' with a lower eave of 18' and a ridge peak height of 27' 7". The building has a curtain on the lower eave and an open front southern exposure. We ran a W-18x40 steel I-beam down the center of the building to carry the parallel trusses. These trusses are set 10' on center. The lower eave treated laminate columns are set into the ground. The I-beam is supported with laminated treated columns every 25' set on a reinforced concrete columns and front laminated columns are set 20' on center and are also supported on reinforced concrete columns. The gable ends walls are set on an exposed 4' concrete wall. We used a high rib steel pattern because of the low-pitched roof (1/12). We also caulk taped all of the seams and splices on the roof steel to further insure against any leaks. Leo came up with some additional bracing techniques using steel brackets and cables, as this was not a conventional post frame structure. The building turned out great and the customer moved in right away. We were challenged to do something out of the ordinary and it is a proud feeling knowing that we were able to meet the challenge and at the same time, saving the customer thousands of dollars on their project. The National Frame Building Association (NFBA) held its annual convention and trade show, Frame Building Expo, February 20-22, 2008 at the Greater Columbus Convention Center in Columbus, OH. During NFBA's Award Luncheon on February 20, first place winners in 19 categories received plaques for the annual NFBA Building of the Year Contest. The Building of the Year Award in the Retrofit/ Remodel category went to Leo Souder of M.P.B. Builders, Inc., Ripon, WI. M.P.B. Builders, Inc. received the NFBA award for St. James Church, built for St. James Church. This building is used for church services in a growing parish. The remodel is important because as the church looked to expand, it was quickly realized that adding on to a 100 year old existing structure was not cost effective. By remodeling the existing pavillion, the church could satisfy their needs. This project was a remodel/ retrofit, so the existing structure was changed by major modifications. These modifications include an insulated aspen wood ceiling, sheetrock walls, cory tile flooring, and cement board siding with cut veneer stone. The remodel comes complete with a covered drive area for parishioners to enter the church. New heating and cooling systems, indirect lighting systems, and the shingled roof are all important elements of the transformation. Post Frame Construction was used for this project because of cost and time limitations. This building's remodel was completed with a new roof, insulated walls, a new aspen wood ceiling, and new heating/cooling and lighting systems. Building Committee Member Vic Schiro states, "We love our place of worship." The National Frame Builders Association (NFBA) held its annual convention and trade show, Frame Building Expo, February 28- March 2, 2007 at Indiana Convention Center in Indianapolis, Indiana. During the NFBA's Award Luncheon on February 28, first place winners in 16 categories received plaques for the annual NFBA Building of the Year Contest. The NFBA Building of the Year Award in the Commercial (over 10,000 Sq.Ft.) category went to Leo Souder, M.P.B. Builders, Inc., Ripon, WI. M.P.B. Builders, Inc. received the NFBA award for the new post-frame building built for Stone Ridge Meat & Country Market, Inc. The building is used for meat processing, along with a full-service grocery store. The building starts with the grocery store as you enter from the main entry. In the grocery area is a produce section, deli, dairy, frozen food, and local bank branch. The building is an 80'x140' & 160'x160'x14' post-frame structure. A timber-frame entry and pre-engineered roof dormers make this an attractive and unique building that fits well within it's surroundings. The commercial building has a 5-piece piggyback truss roof system with covered porches and stone and log siding that makes it truly unique.
" There were individuals that said this structure couldn't be built using wood frame construction, due to code and material restrictions," remarked Gavin Dorsch, engineering manager for MPB Buildings. "We proved that with some creative design work and pre-engineered roof trusses, this project would be a smash success. The post-frame method allowed us to insulate the sidewalls with 8" batt insulation, the the wood-framed attic was insulated with a minimum of 14" blown fiberglass insulation. The efficiency of these components allows all the different elements of heating, cooling, refrigeration and customer environmental conditions to transition with ease. Nobody had attempted or designed the type of truss roof system that we needed to achieve the look that the owner wanted. Post-frame construction methods allowed us to span farther and use materials more economically. This kept the overall cost within budget. It also allowed for faster assembly in the winter season to enclose the structure, which allowed the other trades to continue their work and stick to the construction schedule. With the construction of the facility and the inner workings, this is a very unique and very successful building - and business."